After months of waiting, Xbox 360 owners can finally play the updated, proper version of the gorgeously animated fighter Skullgirls. If you've ever wondered how best to irreparably fracture a fighting game community, you need look no further than Skullgirls. Prior to release and immediately following its debut, the game was heavily hyped as the next big thing thanks to its meticulously detailed 2D animation, clever character designs and all-female cast. Then, things sorta went off the rails. 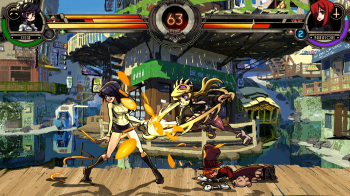 The major issue is that developer Lab Zero Games wanted to release a huge patch for the title, which would change scads of features found in Skullgirls' initial release, but due to the size of the patch Microsoft wouldn't allow the firm to drop the update onto the Xbox Live Marketplace without forking over some serious cash. Lab Zero, being a relatively independent, small group, doesn't have tons of money on hand, and thus the patch sat in limbo for months. To put it more specifically, the 1.01 patch for Skullgirls hit the PlayStation 3 iteration of the game a whopping six months ago, yet Xbox 360 owners are only now receiving the update. As a result of all of this waiting the game's online community on the Xbox 360 is now largely non-existent. The delay killed a lot of that initial hype I mentioned, as competitive players simply don't want to practice a game that they know will be receiving major changes in the near future. Of course, no one could have predicted that "near future" is somehow a synonym for "half a year," but the damage has been done. It's sad too, as Skullgirls is a very solid fighter with a dedicated, attentive developer working to improve it. Depressing history lesson: Over. The key point here is that the patch is now available, and those of you who own the XBLA iteration of Skullgirls ought to pick it up. Owing to the patch's immense size that's a bit more complex than usual, but it basically boils down to players needing to download two separate files. First, you'll need to visit the Skullgirls section of the Xbox Live Marketplace and grab the 273.14MB update found there. Then, the next time you fire up Skullgirls, the game will automatically pull down a smaller, 7MB update. Once both have been installed, you're free to enjoy the current incarnation of Skullgirls. As for what you can expect to see in the patch, that's a rather long list. Instead of dropping a massive text wall on you, I recommend you pay a visit to the official Skullgirls site, as there you can find a proper list of changes direct from the developers.